What the NEC P525WL gives you . . . Physical attributes. Connectors are on the rear panel, and the control keypad is located on the left panel. Air intake vents are on the rear panel, and the heat exhaust vent is on the right panel. Eco Modes. There are two options for running at lower brightness to save power and reduce fan noise. Eco mode lowers brightness by about -40% and Long Life mode by about -50%. Presentation Optimized Lumens. Our P525WL test unit exhibited a slight green bias when set to High-Bright mode, but Presentation mode had no such bias. Since Presentation mode outputs about 4,000 lumens, it is the best choice for delivering crisp, well-saturated color for business presentations. Even in high ambient light conditions, Presentation mode can keep images from washing out. Video Optimized Lumens. Once optimized with slight increases in brightness and contrast, Movie mode reproduces flesh tones better than any other picture mode. Black levels are very good, and highlights are well resolved. At 3,265 lumens, Movie mode can handle moderate ambient room lighting although it can be a bit on the bright side for a dark viewing room. If that is the case, simply turn overall image brightness down using the brightness control in the Setup menu. Zoom Lens Brightness Reduction. The 1.6:1 zoom lens reduces brightness by -17% at full telephoto and delivers 3650 lumens in High-Bright mode. Brightness Uniformity. The laser/phosphor light engine in the P525WL delivers very good brightness uniformity of 85%. No hot spots or shadings are visible with any image content. Input Lag. Input lag is 47ms, which is fast enough for some action simulations, but many need a faster response time. Built-in Audio. The P525WL's built-in 20-watt speaker is sufficient for small rooms, though external audio amplification is probably the best solution for larger venues. Fan Noise. With ECO mode off, fan noise is rated at 27dB in the High Bright color mode, and 24db in all other color modes. With Eco mode on, fan noise is rated 22 dB in any color mode. In practice, the noise is surprisingly low for such a bright projector. In either of the Eco modes, it is indistinguishable from background noise, and even in normal power modes, it is comprised of low and medium frequencies, so it is not a distraction in all but the quietest scenes. If operating the P525WL at altitudes higher than 5,500 feet, NEC recommends using the high fan speed setting. The fan noise increases in all modes, but it is less intrusive than most projectors we've tested. Throw Distance. The P525WL's 1.6:1 zoom lens provides a throw distance range for a 200" diagonal image of approximately 17'6" to 28'2". Mounting and Lens Shift. Thanks to its relatively small size and weight (21.3 lbs. ), the P525WL is easy to mount. Combined with a 1.6:1 zoom lens range, the horizontal and vertical lens shift make it simple to position the image even if small mounting errors have occurred. On our test unit, we were able to shift the image vertically by about 75% of image height. This vertical lens shift exceeds the P525WL's specification of +60% of image height and adds extra flexibility when mounting the projector. The horizontal shift measured from the centered position is ±29% of the image width. For those who prefer to eliminate the rainbow artifacts that can sometimes mar the performance of a DLP projector in dark, high contrast video scenes, the NEC P525WL WXGA LCD laser projector may be just the ticket. Its rainbow-free 3-LCD light engine coupled with 5,000-lumen brightness and a street price under $2,300 is a rare combination. Toss in vertical and horizontal lens shift along with 1.6:1 optical zoom, and you have a potent combination of capability and value. Mounting projectors can be a hassle when room constraints limit placement options, but the P525WL offers plenty of mounting flexibility. In addition to a wide range of throw distance for a particular image size, extensive lens shift and keystone correction can compensate for a variety of mounting errors or make quick work of a temporary setup. Solid image quality offers additional flexibility. Though its WXGA resolution wouldn't make it a likely candidate for installation in a permanent high-ambient-light home theater, it's a good option for a quick borrow from the business suite for a weekend Super Bowl party or similar event. Color for TV and movies is respectable in the best viewing modes, and black levels and highlight rendering are plenty good enough for this kind of presentation. And the P525WL's brightness is sufficient even in Eco mode to keep the image from washing out, even in a fairly bright room. Back in the boardroom or classroom, the P525WL's screen sharing capabilities will be welcome. 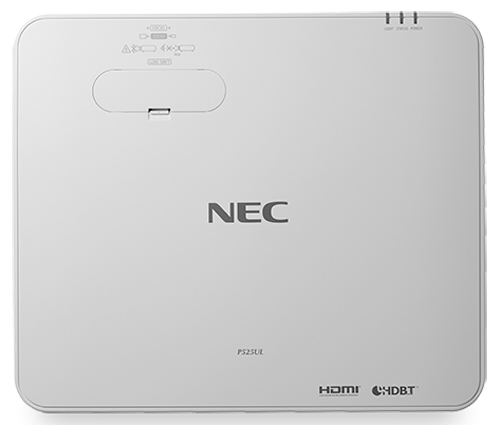 When the projector is connected to the local network by Ethernet or the optional wireless LAN module, NEC's MultiPresenter application software allows multiple computers to share their screen. With the wireless connection, up to 16 mobile devices can access the projector either individually or in split-screen mode with two, four, or 16 screens all shown simultaneously. Similarly, the P525WL's picture-in-picture (PIP) capability allows multiple sources, such as connected computer and disc player, to be viewed simultaneously with one image full screen and the other in one of the four corners of the screen. If you're looking for a bright WXGA projector with a long-lasting light source, excellent data and video rendering, and an attractive street price just under $2,300, the P525WL is a compelling option. But toss in one of the longest warranties available, wide-ranging placement flexibility, relatively small size and weight, and exceptionally quiet fan noise for its brightness class, and it's easy to see why NEC's P525WL should definitely be on your short list.